Since yesterday was Pioneer Day, I thought I’d share my thoughts on one of my favorite Pioneer Hymns. Most of you are probably familiar with Come, Come Ye Saints. It was one of my sister’s favorite songs, and she requested that it be played at her funeral. While I always liked the song, I can rarely sing it without getting a bit emotional as I think of my sister. She was the oldest in my family. My father was a convert, and always referred to her as “the pioneer” of the family. Perhaps that is why she liked the song so much. The last verse is the one that always causes me to think about my sister. My sister died from a brain tumor. She struggled through radiation and chemotherapy for nearly 2 years before succumbing. I often feel like she died before her journey was through, but I am glad she is free from toil and sorrow too. I often wish her life was spared again, but it wasn’t. She left behind 4 small children under the age of 10. Three of them are in college now, and the other is a senior in high school. They have coped very well, and are excellent people. I can remember singing this song at the end of meetings, and thinking it was a nice song to end the meeting. I planned on meeting everyone the next week at church again. But when it was played at the funeral, it took on a whole new meaning. I usually can’t sing the song anymore, but I love to listen to it. I can’t wait to see my brother again. So, what are some songs that touch your heart? We sang a variation of Crossing The Bar at my grandmother’s funeral, and it always touches my heart. Of course, there aren’t too many opportunities to sing that song. Depends on the meeting – at times I have been caught completely off guard and ended up unable to sing. Come Come Ye Saints often gets me, How Firm a Foundation, Be Still My Soul also. One that always gets me is Lord, I Would Follow Thee. I just can’t get through that one anymore – too much personal meaning for me now. I once selected “Where Can I Turn for Peace” to sing at the funeral of a young mother because I thought its message would comfort; but it was a struggle to get through. A few years after joining the Church I was asked to sing for Sacrament meeting “A Poor Wayfaring Man of Grief” Everything was going good until the 6th verse when the image of Carthage Jail flooded my mind. Even while I continued to sing I was praying “Lord, don’t do this to me, I don’t need the distraction”! Our Bishop at the time who requested the song is a descendant of John Taylor. Mark, I really love “A Poor Wayfaring Man of Grief”. I always find that song moving. I attended a family reunion over the weekend. They had a talent show, and someone played “Praise to the Man” on his bagpipe. It was a really special, moving rendition of that song. I’ve heard “Amazing Grace” on the bagpipes, and “Oh Danny Boy” (not a hymn) on the bagpipes and I’ve always enjoyed those as well. I LOVE How Firm a Foundation (re: #2). It’s a little overplayed in Conference, but I still love it. Our Savior’s Love is a great one. Also, anything I know the bass part to I like as well (I’m okay but not that great of a singer). I agree also that songs that have personal connection to us really take on new meaning. “How Firm a Foundation” was also a favorite of mine even when I was a small boy, according to my parents. It is one of the classics. Andrew Jackson requested that it be sung at his death bed. 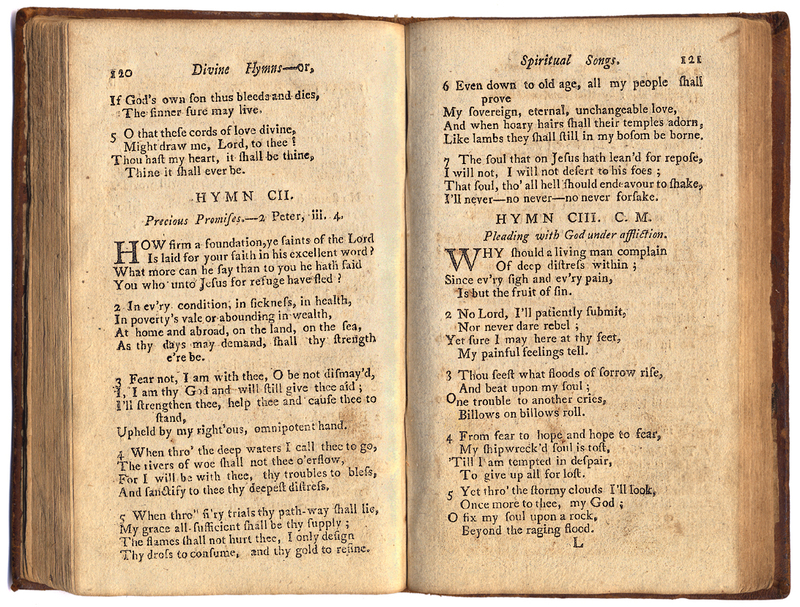 Here is an image of how it looked in a hymnal printed during the lifetime of George Washington . . .
—Joshua Smith, DIVINE HYMNS, OR SPIRITUAL SONGS; For the Use of Religious Assemblies and Private Christians: Being a Collection by Joshua Smith—And Others. Eighth Edition. With large additions and alterations: By William Northup, V. D. M. (Norwich [Connecticut]: Printed and Sold by John Sterry & Co., 1797), 120-21. “He Sent His Son”, “High on a Mountaintop”, “Abide with Me” (both versions), “Now, Let Us Rejoice!”, “I’m Trying to Be Like Jesus”, “All Creatures of Our God and King”, “Beautiful Savior”, “Jesus Once Was a Little Child,” “Did Jesus Really Live Again?”, “Be Still My Soul”, “Come Unto Him” . . .
Obviously too many to list them all. “Abide With Me ‘Tis Eventide.” I always think of the appearance of the Savior on the road to Emmaus. The disciples view of the Savior was “withholden” from them, but their hearts burned within them, perhaps as a test of their faith and to learn of what was in their hearts. They learned to recognize the burning of the spirit. Not until they partook of the Sacrament did they recognize the Lord. It is a wonderful image of our sojourn through life, to exercise our faith and find ourselves where we can find the Savior revealed, when we are willing and partake worthily. I had the lyrics to “O My Father” printed in the programs to both of my parents funerals. For Dad, it’s because he was my father. For Mom, it’s because it tells me I’ve a mother there. I love How Firm a Foundation, and had it sung at Dad’s funeral — all seven verses. And learned that 4 & 5 are tricky in the refrain lines. Still good, but probably should be sung by folks prepared to put a short rest at the end of each line. The Star Spangled Banner (a few weeks ago — the second half of the second verse, and the first 3/4s of the third). There are others that I love, but have not yet been unable to sing. I’m sure that time will come. 9 — Absolutely true. It’s why I get very angry when all but the first verse is cut because time is short. It’s a very rare speaker who can give as good of a message in as little time as the later verses of a good hymn. Or a teacher, for that matter.